Karim Benzema headed in Real Madrid's winning goal against Granada as Cristiano Ronaldo was left waiting to break the club's goalscoring record. Ronaldo, 30, needed a hat-trick to overtake Raul's record of 323 goals, but he has only scored in one of four La Liga games this season. 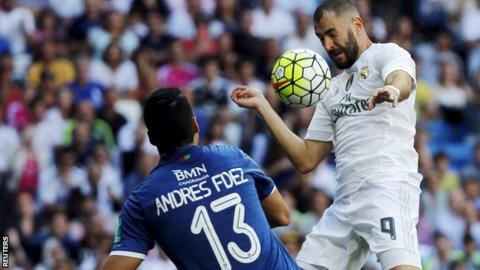 Real were grateful to Benzema, who made it four goals in as many games when he nodded in a second-half Isco free-kick. Rafa Benitez's side went above leaders Barcelona, who host Levante on Sunday. Real were without injured forwards Gareth Bale and James Rodriguez as well as defenders Sergio Ramos and Danilo, but they are still to concede a goal this season under former Liverpool boss Benitez. Goalkeeper Keylor Navas has now kept a club record five successive clean sheets after Madrid had tried to include him in a deal involving Manchester United's David de Gea, which fell through. Navas said: "I had the chance to stay where I wanted to be and I will give it my all to remain here. "It was complicated because you know it is an awkward situation. But that is the past and I try to focus on the present, which is all that matters." Real had scored 15 times in their previous three games and last season beat Granada 9-1 at the Bernabeu Stadium when Ronaldo scored five times. They again created numerous chances with Ronaldo enjoying opportunities either side of the break to close in on Raul's tally. Goalkeeper Andres Fernandez denied the Portugal international with a number of fine saves but was unable to prevent Granada's first away defeat of the season. Elsewhere, former Liverpool and Chelsea striker Fernando Torres came off the bench to make one goal and score another as Atletico Madrid won 2-0 at Eibar to move above Barcelona into second place and within a point of Real at the top of the table. Valencia drew 0-0 with Real Betis and although David Moyes' Real Sociedad scored their first goals of the season they are still without a win following a 3-2 home defeat by Espanyol. Match ends, Real Madrid 1, Granada CF 0. Second Half ends, Real Madrid 1, Granada CF 0. Attempt blocked. Nico López (Granada CF) left footed shot from outside the box is blocked. Assisted by Miguel Lopes. Corner, Real Madrid. Conceded by Cristiano Biraghi. Attempt blocked. Javi Márquez (Granada CF) left footed shot from outside the box is blocked. Foul by Pepe (Real Madrid). Nico López (Granada CF) wins a free kick in the attacking half. Hand ball by Denis Cheryshev (Real Madrid). Cristiano Biraghi (Granada CF) wins a free kick in the defensive half. Substitution, Real Madrid. Casemiro replaces Isco. Delay in match Andrés Fernández (Granada CF) because of an injury. Attempt missed. Denis Cheryshev (Real Madrid) left footed shot from the centre of the box is close, but misses to the right. Foul by Javi Márquez (Granada CF). Rene Krhin (Granada CF) is shown the yellow card for a bad foul. Denis Cheryshev (Real Madrid) wins a free kick in the attacking half. Foul by Rene Krhin (Granada CF). Foul by Denis Cheryshev (Real Madrid). Miguel Lopes (Granada CF) wins a free kick in the defensive half. Substitution, Real Madrid. Denis Cheryshev replaces Karim Benzema. Substitution, Granada CF. Nico López replaces Edgar Méndez. Hand ball by Lombán (Granada CF). Attempt blocked. Rene Krhin (Granada CF) right footed shot from the centre of the box is blocked. Assisted by Fran Rico with a cross. Corner, Granada CF. Conceded by Raphael Varane. Attempt blocked. Cristiano Ronaldo (Real Madrid) right footed shot from outside the box is blocked. Foul by Miguel Lopes (Granada CF). Javi Márquez (Granada CF) is shown the yellow card for a bad foul. Lucas Vázquez (Real Madrid) wins a free kick on the right wing. Corner, Real Madrid. Conceded by Doria. Substitution, Granada CF. Fran Rico replaces Rubén Rochina. Robert Ibáñez (Granada CF) wins a free kick in the defensive half. Attempt missed. Cristiano Ronaldo (Real Madrid) left footed shot from the left side of the box misses to the right. Assisted by Luka Modric. Attempt missed. Raphael Varane (Real Madrid) header from the centre of the box is just a bit too high. Assisted by Lucas Vázquez with a cross following a corner. Corner, Real Madrid. Conceded by Andrés Fernández.